A couple of weeks ago, I made a passing comment about embarking on a run of impressive anime shows, shows which I haven’t had to whinge about in these paragraphs. I guess I jinxed it, as this week we court mediocrity, beginning with Attack on Titan Junior High. It’s a spin-off from the ever popular Attack on Titan, and that’s where my qualms begin. I am not a fan of the ever popular Attack on Titan, and that antipathy extends to its spin-off, where the characters are re-imagined as students at the titular school, having to co-exist with Titans that insist on stealing their pack lunches. You need to have seen the original show, and you have to get with its sense of humour, something that I didn’t find too easy to manage. 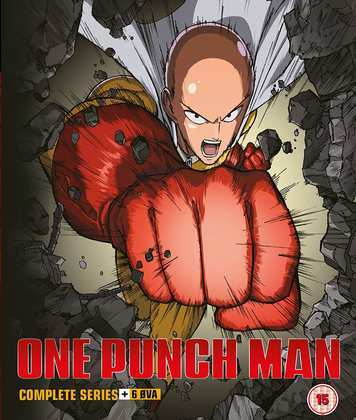 Take all that was good about Tiger & Bunny, and all that was good about Samurai Flamenco (there were some good aspects to that show) and put it all together along with a fair amount of originality, and you have One Punch Man, a brilliant show looking at the life of a superhero who is just too darned powerful. The clue’s in the title. There is no foe robust enough to stand up to him, there’s just no challenge in it any more. One Punch Man is a brilliantly observed satire of the superhero genre, but one created by someone with a whole lot of love for comic book heroes. 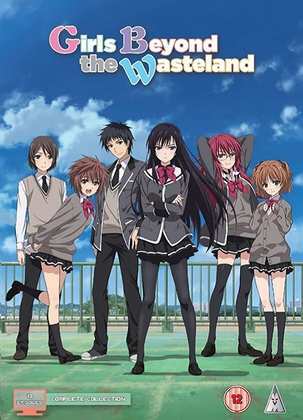 The third review of the week was for Girls Beyond the Wasteland, another show which follows the tried and trusted route of chronicling the lives of members of an after school club. This particular club have as their goal the creation of a dating simulation, a videogame. It’s a clichéd storyline, which delivers the familiar and the comfortable, and unfortunately for the show it takes over half the run before you understand that there is a little more nuance to the characters than normal, and it’s really only the final four or five episodes that make you sit up and take notice, realise that there is something worthwhile in the story. It might be too little, too late. Click on the review to see if that is so. Suzuka. I’ve mentioned this before, but conventional love stories are pretty uncommon in anime, boy meets girl is less preferable to boy meets harem, so seeing something conventional to the point of realistic is worth talking about. Suzuka’s animation isn’t too hot, and its tale of romance in an after school athletics club has an air of fantasy to it, but the relationship between the titular Suzuka Asahina and Yamato Akitsuki has an air of awkwardness and the typical teenage lack of communication that many of us will remember with embarrassment. Not a lot of people liked Suzuka the character; some pretty offensive things were written about her in anime forums, and you can see why. The anime romances that we usually see are written from the point of view of the male protagonist, and the girls are defined in terms of the boy, they may be tsundere, they may be submissive doormats, they may be the big sister types, but their characters only exist in reaction to the boy. Along came Suzuka, and suddenly she had her own thing going on. She was a rounded, realistic character who had a life outside of Yamato. She’s focused on her athletics career, not a boyfriend, and if romance happens, it’s an addition to her life, not her whole life. For once a girl was written as a human being in anime, and the haters hated it. Revelation Films almost released Suzuka in the UK in 2007. They got as far as volume 4 before they stopped, and I wound up importing the final two volumes from Funimation in the US. Here’s my review for volume 1. Unsurprisingly, all four Revelation volumes are still available to buy in the UK (who’s going to buy two-thirds of a series?). If you can spin Region 1, the Funimation S.A.V.E. release is at a bargain price. 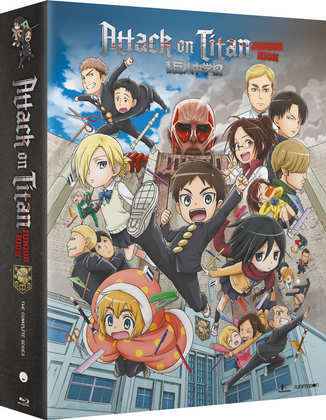 Funimation released Attack on Titan Junior High on Collector’s Edition Blu-ray and on Standard DVD back on June 26th. Kazé Entertainment released One Punch Man as a Collector’s Edition Blu-ray and Standard DVD on July 17th, while MVM release Girls Beyond the Wasteland on DVD and on Blu-ray today.